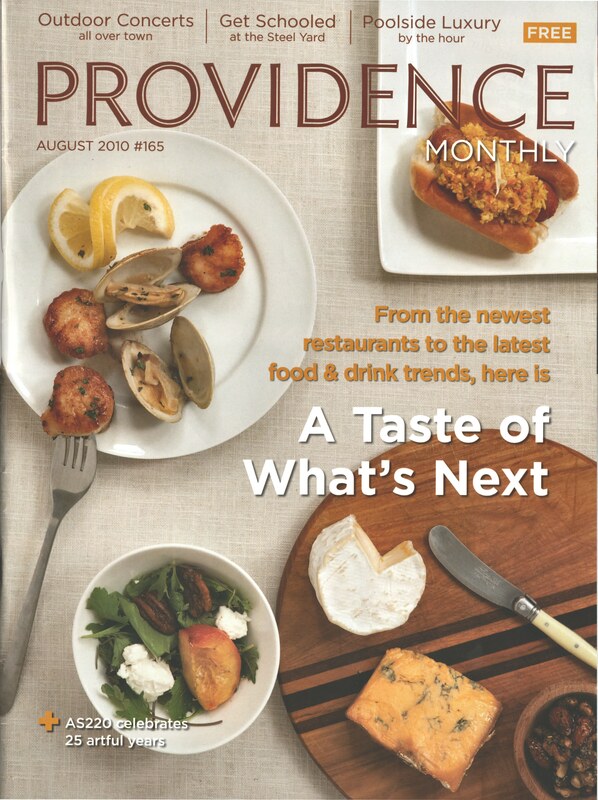 At Long Last The August Issue of Providence Monthly Has Arrived! I began to think I’d never see a copy, but after many phone calls and emails, my “contributor’s” copy arrived today, 03-September-2010. If you haven’t found a copy for yourself yet, there were 18,000 copies printed, so you should be able to find one if you’d like to add this to your collection. These are very large images in their full size (10″ X 13.5″, scanned at 600 d.p.i.) so downloads may take time. Every news program, publication, or service, needs current cultural, geographical, historical, human-interest, and travel stories; and I’m hoping you will consider doing a piece in August on H.P. Lovecraft and his beloved home-city of Providence, Rhode Island. August 20, 2010, will mark the 120th. anniversary of the birth of H.P. Lovecraft in Providence, Rhode Island. Howard Phillips Lovecraft (August 20, 1890 – March 15, 1937) was one of the most influential cosmic horror writers of the 20th century. And is considered by many to be the father of modern horror. His influence can still be seen in movies and television, games, music, art, comics, plays, podcasts, radio dramatizations; and even plush Cthulhu dolls based upon his most famous creation. His works are still affecting modern writers, i.e., Stephen King, film makers, i.e. John Carpenter, Stuart Gordon, and Guillermo del Toro, and the gaming industry with all of its Call of Cthulhu related role playing games. And many of his fictional creations, e.g., Arkham, Miskatonic University, Cthulhu, the Necronomicon of the Mad Arab Abdul Alhazred, and Innsmouth often make appearances in literature and films. Their are articles, bibliographies, biographies, college courses, conventions, documentaries, events, film companies, film festivals, library collections, license plates, newsgroups, periodicals, radio broadcasts, tours, and websites dedicated to him. While Lovecraft is best known for his weird-fiction, he also wrote on Philosophy, Science, and Travel, contributed Reviews and Literary Criticism, was very active in Amateur Journalism, and most of all, was a voluminous letter-writer; with an estimated 100,000 plus (sometimes 70 pages and longer) letters written in his lifetime. Brown University in Providence maintains the single largest collection of original and Lovecraft related materials in the Special Collections section of the John Hay Library. Please use any of the above information that helps you; and contact me if you have any questions or comments. Thank you for taking the time to look this over! Yes, I have had CTHULHU license plates in California for thirty years. We received your email about the Lovecraft anniversary, and we think it’s a great fit for the back page (“The Last Detail”) of our August issue. Do you have a hi-res photo of Lovecraft’s grave stone that you can send me? (Vertical orientation would be best.) We will, as you note on your Flickr page, credit you and send you a copy of the magazine. And photo L_08 from http://www.flickr.com/photos/cthulhuwho1/3809326421/in/set-72157624114618268/ became the chosen photo for the piece. 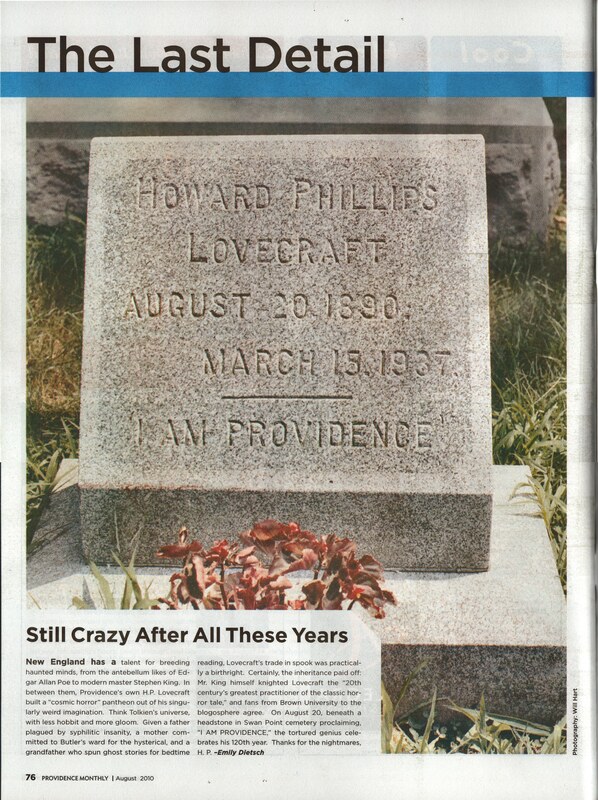 This entry was posted in H. P. Lovecraft, H. P. Lovecraft Updates, Providence Monthly, William (Will) Hart and tagged 2010, August, Grave Marker, Gravestone, Headstone, Lovecraft, Providence Monthly, Will Hart, William Hart. Bookmark the permalink. 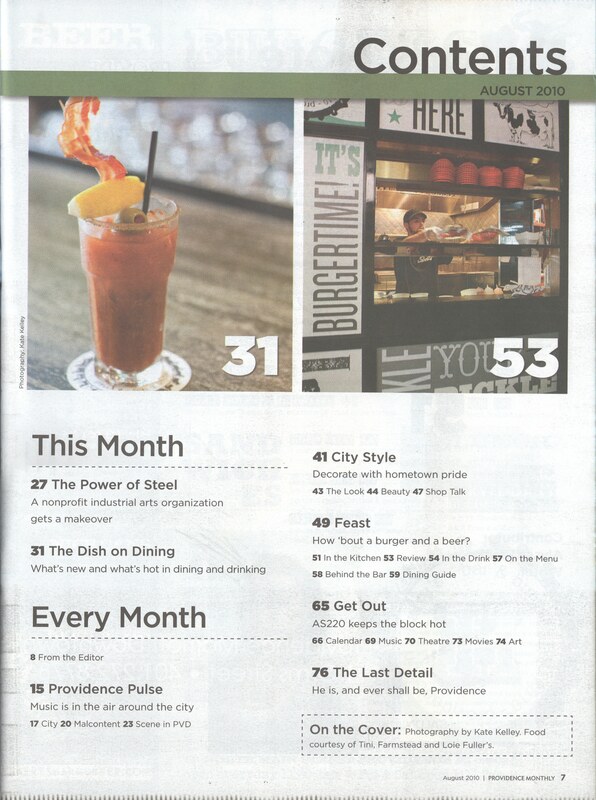 3 Responses to At Long Last The August Issue of Providence Monthly Has Arrived! Congratulations on the big photo spread! Will – Living in Australia, there’s no way I could get this. Is there any chance you have a spare copy you could sell or trade me so I can add your piece to my collection? It was extremely difficult for me to even get my “Contributor’s” copy, so spare copies may be very hard to come by. That’s one of the reasons why I carefully made the 600 d.p.i. scans (which I had to paste together from top and bottom scans due to their large size). Send me a private message by way of willhart-at-roadrunner-dot-com with a mailing address for you; and if I manage to acquire a “spare” copy, it will become yours; just because you asked first.